The exposition "Bicycle and Lithuania" opened in 2004, represents the historic development of the bicycle – from its invention till nowadays. The bicycle is introduced here not just as one of the oldest and most popular means of transport, but as the means of popular in the world bicycle sports as well. The visitors supposedly will not start to invent the bicycle once again, but they will take with them much new and interesting from the Museum. The exposition is aranged not just following chronology, bet also assorting exhibits concerning the themes: "The Great Millennium Peace Ride Around the World", "The Bike is Invented. Ride the Orange One", Šiauliai Bicycle and Motor Factory "Vairas", JSC "Vairas", etc. In 2010, the newest theme – "Bicycle Sports in Lithuania" - was presented. The exposition starts from the oldest bicycles, being exposed on the 3-rd floor. 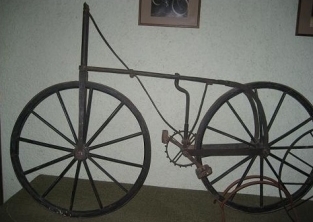 Here is presented a copy of the oldest forerunner of the bicycle – a celerifere – "a running machine", on which in 1792 Earl de Sivrac was riding in Paris by pushing against the ground with his feet. This heavy wooden machine was without a handlebar and had just an armrest. This copy of celerifere was constructed in 1977 by joiner-pattern-maker V. Stakeliūnas , who worked then in factory "Vairas". The most unique in the exposition there is the home-made bicycle constructed in Žagarė at the end of the 19th century. All its details were forged from iron or carved of wood. 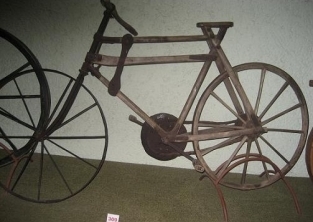 The Museum obtained this bicycle (picture 1) in 2002 from a person, living in Šiauliai district. Another valuable home-made bicycle, called „grandpa", was forged in 1914 by a skilfull Lygumai smith Kazys Šuopis (picture 2). One of the oldest exhibits here is the child's tricycle forged of iron in 1905, with wooden saddle covered with red velvet. Between World Wars, the most popular bicycles in Lithuania were those made in England and Germany. Here on display there is a sports bicycle "Dürkopp", produced in Germany, 1926, and donated by Julius Kasparaitis, living in Leipzig, Germany. The most interesting modern bicycles presented in the exposition: American mountain bicycle "Legacy" (1992), circus unicycle "Pfander", produced in Great Britain, 1991, the bicycle from Czechoslovakia, 1986, used for figure riding and veloball, interesting construction tricycle for adults "Desna" (picture 3). On the 3-rd floor there is a newest exposition "Bicycle Sports in Lithuania", with presented here sportsmen's awards, their outfit, bicycle sports accessories, Vilma Rimšaitė's (international class bicycle sports master, living in Šiauliai) BMX bicycle. On the 2-nd floor the exhibits are displayed according to the themes. Here the main attention is given to the cyclists, glorifying the name of Lithuania widely around the world. 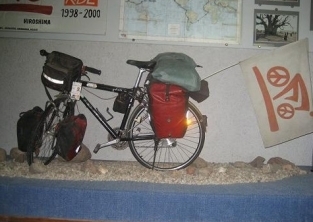 The exposition presents personal belongings, travel appliances, photographs and the bicycle of Liudas Alseika (1887–1960), one of the most famous Lithuanian bike travellers, an organizer and a leader of the first intercontinental bicycle trip "Klaipėda- Vladivostok", 1960. Undoubtedly interesting experience is to explore the bicycle "Red Bull", by which Sigitas Kučas together with his associates in 1998 toured around the world. This donated by S. Kučas bicycle was made in Germany according to the special order (picture 4). One showcase is devoted to an action "A bicycle is invented. Ride the orange one! ", initiated by former Vilnius mayor Artūras Zuokas and supported by Vilnius municipality. 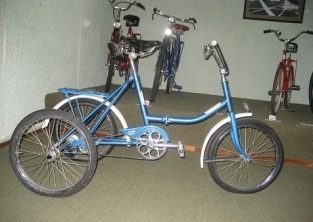 The most space here is devoted to the bicycles produced in Šiauliai Bicycle and Motor Factory "Vairas": "Ereliukas" and "Kregždutė", the first bicycles made in Lithuania in 1951; a ten-millionth bicycle "Ereliukas", produced in 1984, with blue frame and inscription "Ten million"; bicycle "Vyturėlis" with universal frame, suitable both for girls and boys (made in 1974); bicycles "Venta" and "Rambynas", that were started to produce in 1983 – the bicycles with demountable frame. After reorganization of The "Vairas" Factory, a joint Lithuanian and German enterprise "Baltik-Vairas" was established. It is part of German concern "Panther", producing bicycles. The threemillionth bicycle "Panther ", made in Šiauliai is here on display. One part of the exposition is devoted to velomobiles – transport means of the future. 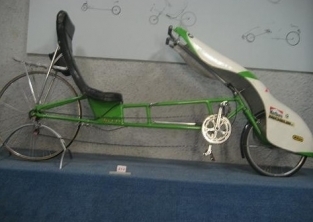 The Bicycle Museum shows a velomobile "Meleta", constructed by Rimantas Martinkėnas (picture 5), Henrikas Sutkus' velomobile "Šiauliai", and Vidmantas Valys' two-seater velomobile. Visitor's attention is particularly attracted by functional bicycle models, constructed by H. Sutkus. Agency "Factum" certified them being the smallest bicycle models in Lithuania. The first floor is devoted to exhibitions, there is also a space allotted to video reviews. The exposition "Bicycle and Lithuania" is one of the most attended Šiauliai Aušros Museum's expositions. Authors of the exposition: senior museum specialist Algirdas Zaukas, restorer Virginija Kulikauskaitė, artist Vita Andrulienė. Exposition's supporters: UNDP GEF (United Nations Development Programme, Global Environment Facility) Small Grants Program, Lithuanian Culture and Sports Foundation, Vilnius City Municipality, Šiauliai City Municipality Environment Department, Šiauliai County Ecological Study Centre.